THE PRESIDENT: Welcome. This is the sixth night of Hanukkah, the Jewish festival of lights. This holiday marks the victory of Jewish patriots over oppression more than two millennia ago. 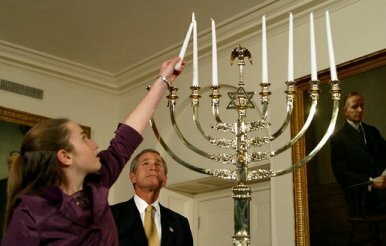 The menorah represents an ancient miracle, in which a lamp with only enough oil for one day burned eight. Each year, Hanukkah brings a message of hope -- that light will overcome darkness, that goodness will overcome evil, and that faith can accomplish miracles. Today, the spirit of those early patriots lives in the lives of the state of Israel and throughout the Jewish community, and among all brave people who fight violence and terror. We pray that this season of light will also be a season of peace for the Jewish people. We are joined this evening by the members of the Ramaz Chamber Choir. Ramaz is a modern orthodox Jewish day school in Manhattan, and we're grateful to the students for making the trip to join us today. I also want to thank Congregation Rodeph Shalom in Philadelphia for the use of this beautiful menorah. Founded in 1795, Rodeph Shalom was the first Ashkenazic congregation established in the Western Hemisphere. Lighting the menorah will be Daniella and Alexandra Wald from New York City. We welcome the girls here, and the honor is yours.